Cheryl Brackett, SAD 49 director of operations, and Cory Rogers, the special education director, have been on leave since March 22 in "an effort to reach a mutual agreement regarding the terms of their employment," according to the superintendent. FAIRFIELD — Two administrators in the local school district are on voluntary paid administrative leave, according to the superintendent, a move that also comes after the district approved eliminating or changing their jobs. Cheryl Brackett, the director of operations, and Cory Rogers, the special education director, have been on leave since March 22, School Administrative District 49 Superintendent Reza Namin said. In the meantime, Namin said he and Assistant Superintendent Roberta Hersom would take over their duties. He would not elaborate on the reason for the leave. Brackett earns a salary of $79,655 and Rogers, $88,895. Namin said they are being paid their full salaries while out on leave. The move comes shortly after the district approved an administrative restructuring plan put forward by Namin, who started working in the district in August and put the plan before the school board for approval in January. SAD 49 consists of Albion, Benton, Clinton and Fairfield. The restructuring plan includes eliminating three administrative jobs, restructuring and advertising for five others and adding two new positions by June 30. Brackett’s job is one that is scheduled to be eliminated, while Rogers’ job would be restructured, given a new title and description and advertised for. 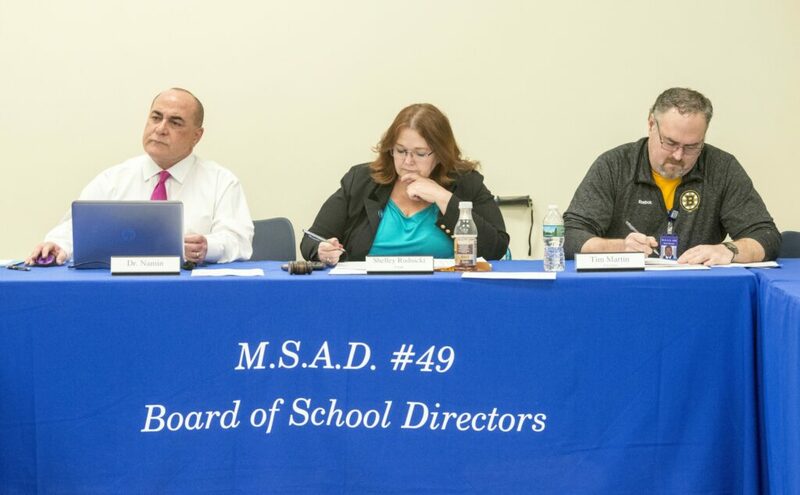 Employees were mostly quiet on the restructuring changes in the immediate aftermath of their approval, but there are indications the district could face legal ramifications or have to pay out settlements to employees because of the plan. Both Brackett and Rogers declined to comment on the situation Friday. At Thursday night’s budget workshop meeting, school board member Jenny Boyden, of Clinton, expressed concern it could result in significant costs that haven’t been budgeted for. The restructuring originally was estimated to generate an annual cost savings of $113,000. Boyden said Friday she didn’t know how much the plan could end up costing the district. Boyden, who voted against the plan when the board approved it in January, said board members haven’t received enough information on it to know if it will help the district run better or more efficiently, which is part of the reason she originally did not support it. Namin would not say Friday what potential costs could be associated with the restructuring or how much they could be. In February, the board received a letter from affected employees threatening to sue the district. Namin has declined to release a copy of the letter to the Morning Sentinel, saying to do so would be a violation of Maine law protecting the privacy of certain employment records. He said Thursday any potential costs of restructuring would come out of the 2018-2019 budget and would be associated with salary lines. However, he did not answer when asked if there would be additional costs such as a financial settlement for affected employees, and if so, where in the budget that money would come from. 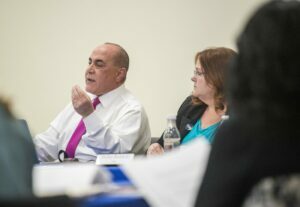 The concern about the cost of restructuring was among a handful of issues discussed Thursday night as board members moved to approve a $27.1 million 2019-2020 budget. The budget passed 6-5-1 and will now head to a district budget meeting May 14 and a referendum June 11. A breakdown of the board voting was unavailable Friday. The budget as originally presented by Namin included the use of $1.8 million in reserve money to produce a tax increase of less than 1 percent in all four towns in the district. Board members instead moved to reduce the amount of reserve to $1.1 million, which Namin said still will maintain a minimal tax increase. This is the first year the district has taken a schools-based approach to the budget, with principals and school committees in individual schools serving as the starting point for what they’d like to see in the budget. The budget includes five new teaching positions, which Namin said will address problems with class size and replace some positions that were cut in the last budget cycle. It also includes the loss of a mathematics coach at Benton Elementary School, because of a loss of state funding for the position, and the loss of an elementary-level literacy coach, as the job was moved to another position. Some board members expressed concerns about the way the changes were made, saying they thought there was no communication with them.